Check out these two recycling rangers from White Plains Ridgeway Elementary School. They are bringing the organic snack waste from their classroom to the lunchroom. There it is combined with the food waste that will be composted. White Plains has adopted the We Future Cycle Recycling Program last year and is working hard to make its schools a waste free environment. And Ridgeway is very much on its way. The lunchroom has reduced garbage by a whopping 95% through sorting and diversion into recycling and composting and each classroom is doing the same thing. Students learned in We Future Cycle presentations how to reduce snack waste by choosing naturally unwrapped foods as well as using reusable containers. Each time a student was waste free he or she got a leaf to paste on the “Ridgeway Caring Tree” and the tree looks beautiful and very “leafy”. Every day, students of all grades bring their organics down to the lunchroom and carefully clean their pail. Head Custodian Pedro Molina reports that there is practically nothing in the trash at the end of the day. Walking into a classroom full of excited 6 year olds, toting your worm composting bin is an adventure in itself. The “uuuuh”, “aaahhhha” and “YIKES” were ear splitting, most students also expressed how gross they thought worms were. However, it didn’t take long for them to understand the important role that worms play in our environment. Students learned how worms eat and the explanation of what comes back out was drawing big laughter . They giggled as they tried the new words out. Eisenia Fetida, the latin name of the red wriggle worm, is now a household name among these first graders. Worms and their “castings” were investigate under the magnifying glass and all students touched and smelled the worm castings to make a scientific analysis. 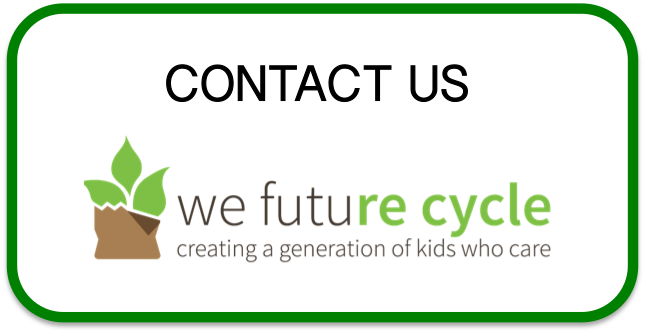 We Future Cycle is proud to provide sustainability education to the New Rochelle School District and class by class, students are learning how things work together and how they can make a difference. Fostering understanding for the cycle of life and the importance of all beings in this cycle in young children will change communities. Vincent’s mom already shared with the teacher how the information came home and how Vincent now considers worms and other critters his friends. New Rochelle School District has committed funds to Sustainability Education knowing that it is a capital improvement project that will shape and educate the whole child. Truly fantastic. Check out this fantastic art work from recycled material decorating the hallways of New Rochelle Isaac Young Middle School. Can you identify all the materials used for this fantastic knight? What happens to the food waste that New Rochelle students are sorting out in the lunchroom to be composted? How does composting work and is it really worth the effort? Those were questions that New Rochelle Trinity 5th graders are learning the answers to. We Future Cycle, a not-for- profit organisation specialized in large scale sustainability programs has been working with Trinity Elementary school and its 1000+ students for years now. Source separation and words like commingled and compost are second nature to these kids. In classroom presentations, students learned what happens to food that is put into a landfill, they learned about harmful Methane as potent green house gas and large contributor to global warming and they learned about the chemical processes that take place inside a compost pile. Giggles and audible gasps were heard when they learned that each one of them is a decomposer as the banana that might go into their mouth does not come out quite like a banana again. The best part was digging in the dirt as they got to examine up close and personal four different soil samples. Inspecting them while looking for color, texture, water retention capabilities and organic matter content gave them a deep understanding of the connection between healthy soils and its ability to grow food. Each worm they found was greeted with cheers and great enthusiasm. Trinity’s 5th graders have learned now that treating food waste as garbage is wasting a valuable resource. Making compost from food waste and leaves is making black gold, and it saves a lot of money.